“Commissions that stick” is not just a catchy slogan. It accurately describes this unique program based on the theme of Sticky Content and Copywriting. Content marketing is the hottest online marketing topic today and these programs connect the dots from content to conversion. What you’ll find is an interrelated suite of products. Your commissions stick (are cookied) with you no matter where your referrals enter or how they move through the product suite. There is a low cost gateway product. 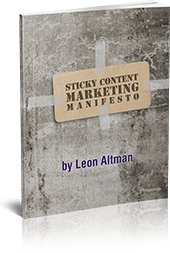 Highly affordable and very valuable: The Sticky Content Creation Crash Course reveals the principles that make any kind of content sticky. The other products are more specific and expand on these principles: Sticky Reports, Blogs, Emails, etc. Some products are geared toward people facing difficult tasks. e.g. someone doing a product launch will be interested in the Product Launch Critique and Tweak copy product. Commissions for Super JVs- Invitation Only. Commissions for the entire product suite are all cookied and ongoing for those who sign up for the program before May 15, 2014. Afterwards JV commissions will be applied one product at a time (including upsells).